"When I am doing nails, I want my nail drill bit to do the job FAST, SMOOTH (no vibration), and with LESS HEAT. 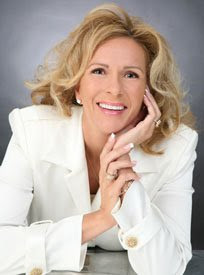 I would love for you to try my drill bits so you can see for yourself the difference. 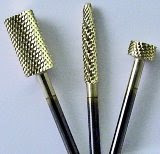 I have chosen my 3 top favorite drill bits for you to try, in a special introductory promotion." Made in the USA to my Specifications. Made from 100% "Carbide" so they cut and file nails FAST. Made with a unique "center-less machine" that balances each drill bit as it is being shaped, so each drill bit will feel SMOOTH without any vibration while doing nails. Made with a specially formulated "zirconium coating" that CREATES LESS HEAT while drilling nails. Easy to clean. Soak in acetone to keep grooves clean and sharp, then disinfect. Can be easily disinfected to meet State Board guidelines (will not rust or get dull). Make sure you have 2 each of your favorites, so you can disinfect one while you are using the other one. This saves time. The 3/32nd shaft, fits virtually every nail drill on the market.Use on acrylic nails and Gel nails (Do not use on natural fingernails). Large Barrel (medium) I use this drill bit to shorten the free-edge on nails fast; to re-shape the C-Curve and to thin out the tip of the free-edge. Long Pointed Pencil (coarse) I designed this drill bit for all Pink & White backfills. It drills out the smile line beautifully & quickly, without leaving any shadows when you apply your product. Also, use to clean out underneath the free-edge. 2 week Wheel (coarse) I use this drill bit for doing 2 week Pink & White backfills on short free-edges, because it is easy to control when you do not have a lot of product at the smile line to drill out.